Modern Apartment with Breathtaking Views! Ideally located a one bedroom apartment in Vista D'Oro, t on the hillside just below the village of Perledo and 5 minutes up the hillside by car( 30 mins walk) from the romantic and historic town of Varenna. With sensational views of Lake Como from the living room and large private garden, this apartment is ideal place to tour the area and is on the main Senteria del Viadiante path( path of the wanderer) which leads to other local villages up the mountain. The apartment has the use of the residents outdoor swimming pool and has secure garage parking. Hello I'm Carmel married to Paul owners of Casa Caterina. We are Irish and live in N Ireland with our 4 children. I am employed part time in Healthcare, working with disability. My husband Paul runs his own transport company which imports Italian goods, mainly tiles, to Ireland and the UK . This is the main reason we came about owning a property here as we travelled to Milan on business quite a lot. We first discovered this area 15 years ago with our young family when we decided to take a break from our usual 2 week child orientated camping holiday and headed Como direction. We knew a little about the Como area but were not prepared for the sheer magnitude and beauty of the place. Maybe it is the mountains, the lake, the climate or a combination of all 3 but the general atmosphere seemed to nourish and revitalise the soul instantly. That summer holiday was the best ever holiday with the hiking, the touring and the children having endless fun jumping from a platform into the lake. When we decided to buy out holiday apartment we knew we wanted it to be in the Varenna/Perledo location but had to wait almost 8 years to find a place that captured the magic of the area. Casa Caterina is that spot! I choose our apartment because its situation give the best views of lake Como and because of its large private garden. I love the outdoor life and spend endless hours gardening with the back drop of the mountains and lake, gaining inspiration from visiting the magnificent Italian villas nearby. There is so much to do close to the property. We spend a lot of our time now hiking in the local area regularly going to Bellano, an hours trek away, have lunch and return by train or bus.The property is a great base to explore the wider Como area also. A popular destination by ferry is Menaggio and Bellaggio situated on the famous golden triangle area of the lake just a 15 crossing away. It is always lovely, however, to return home again just to relax on our patio enjoying the beautiful Italian wines and delicious simplicity of the local food. The options are endless. Delightful apartment, WORLD CLASS VIEW!!! We spent 6 days at this lovely little apartment perched on the hillside between Varenna and Perledo. The views are what sold me on choosing this apartment, and boy, they did NOT disappoint! We pinched ourselves each morning we awoke and looked out over the sparkling blue of Lago di Como and the stunning mountains surrounding us. Sunset was our favorite time of day, we made sure to be home and seated on our terrace each night to soak in that incredible experience with a bottle of the local Nebbiola wine. We felt like we were on top of the world. The apartment itself is simple yet functional. Not fancy, but pleasant, clean and comfortable. And very quiet, being up on the side of the mountain. The walk down to town along the Sentiero del Viandante cobblestone trail is not for the weak or elderly, it is quite challenging and steep in places. We chose the longer route along the road several times and it proved much less treacherous. We never attempted the walk up to the apartment as either the trail or the road would be a steep climb, so we just made good friends with one of the taxi drivers in town and called her for rides up the hill (10euros) each time. Well worth it! And as there are no markets nearby the apartment, all purchases have to be carried in, so the taxi was the only choice for us. We absolutely loved our stay at this lovely apartment and would return again. Varenna now owns a little piece of my heart, and this apartment is a big reason why! 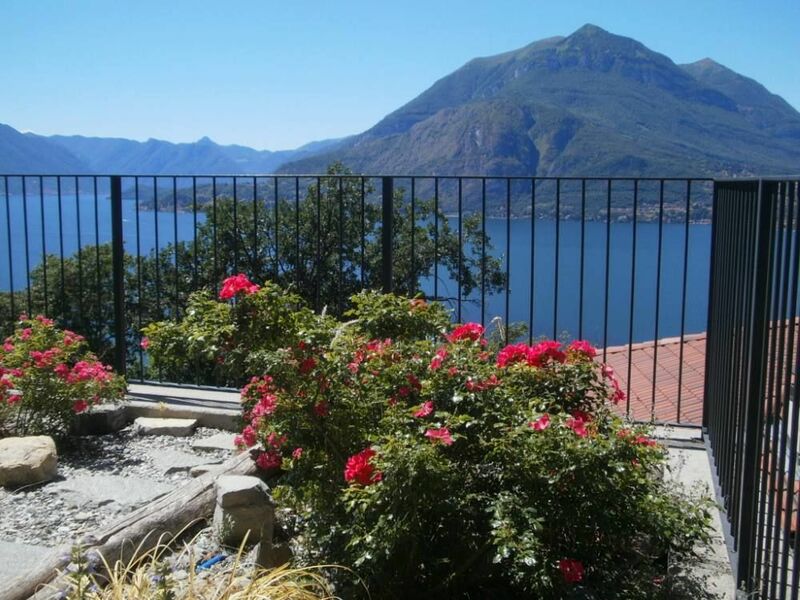 Situated in the hills above the town of Varenna the views from the large private garden are amazing. The walk up from the town takes about 35 minutes, perhaps less for the younger generation. There is small supermarket further up the hill about a ten minute walk. Plenty of restaurants to choose from in Varena which also has good bus, train and ferry services. More attention to detail regarding cleaning (particularly the odor of cigarettes) would definitely move this apartment into the 5 star plus category. Vielen Dank für unser bester Urlaub, herrliche Aussicht, schöne Wohnung und schönen Teil der Welt. This place has an amazing view. I would stay again. Enough said! recommend! We packed a lot in to our 5 day break; The 20 minute walk to Varenna castello is well worth a visit. We discovered a small 'Aladdin's cave' pottery shop there, with beautiful usual pieces. Also went on other hikes in the area, one being a 3 hour hike from the apartment in the Valassina mountain range. Got the bus back after rewarding ourselves with a delicious lunch in an agriturismo in Ortanella Esino Laria. Took it easy the next day, sunbathing in the garden looking across the lake at the snow capped Alps ..quite surreal! The apartment is situated approx 2 kilometers above the picturesque village of Varenna which is approx 60 min train ride from Milan railway station or 1.20 mins drive from Bergamo airport. I recommend hiring a car as the climb up the mountain is steep. A taxi service is available at train station if not driving. Varenna is the ideal location, being on the Golden Triangle (Varenna, Bellagio and Menaggio). With a truly ancient cobbled town as your backdrop, you can travel around Lake Como by ferry (car ferries are only available in the 'triangle'), explore the villas and gardens and delight in the romantic setting whilst enjoying the local cuisine fresh from the lake. Varenna's Romantic Promenade - If you walk along the waters edge to the right of the ferry terminal you will naturally be led to the lakeside promenade 'La Passerella' which is a cantilevered walkway coming out from the rock face of the shore. A favourite with romantics and especially beautiful in the evening as the sun is going down. Varenna may be the most picturesque town on the lake, its steep winding alleys lined with charming homes, flowering balconies and lace-curtained windows. Just above it is the ancient castle where Theodolinda, Queen of the Lombards, is said to have died in the 7th century. Two famed villas to visit here are Villa Cipressi, with terraced gardens cascading right down to the shores, and Villa Monastero, a true showcase.